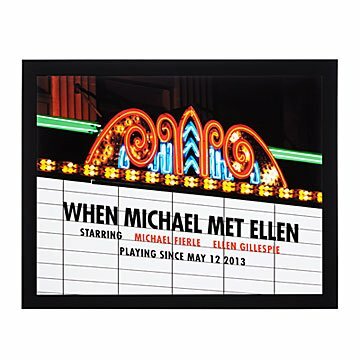 Celebrate your unique romance in cinematic style with this creative movie marquee art. Featuring the "co-stars" (your names) and a special date, you can include your own title or pick one of three inspired by popular romantic films. Choose from full color, film noir-inspired black and white, or classic sepia. A timeless, unique way to commemorate a wedding or anniversary, the piece pays tribute to the greatest love story of all time: yours! Printed and framed in Portland, Oregon. Received this as a gift? Follow the instructions in this PDF to customize your movie marquee art. Check out the Personalized Movie Marquee Illuminated Art™ here. It is so unique and meant a lot to my husband and I as we celebrated our first wedding anniversary. Our family and friends think it is a beautiful gift to celebrate the love we have for each other. I bought this for my husband for our Anniversary. He loved it since it is one of a kind. We hung it in our bedroom. Everyone thought this was a unique, perfect gift. My parents loved this gift! It was perfect for the movie buffs that they are, and commemorated the love they have had for each other for the last 60 years. Perfect anniversary gift for movie lovers in love! Our home theatre is decorated with fav. pics of all our kids (4) & my husband & mine. This sums up where the first "love story" began for us. It will be perfect there! I would definitely buy this type of product again. I loved it and ordered it in the old-fashioned sepia tones, but it also looked good in b&w and color. Should allow for more personalization in last line. Wasn't able to properly document the particular occasion. A gift for their new home. As mentioned above, it would have been great to have a gift wrap option - helps prevent double shipping or having to beg someone on recipient's end to gift wrap it.